Designed, integrated & commissioned in the year 2007 and annual maintenance till date is carried out by DESCON. Application description: Control System for Lube Oil Blending Operations. Variety of Base Oil and Additives are measured by Promass and transferred to blending kettles while the quantity verification and blending operation are monitored and controlled by E+H ControlCare hardware and PView Visualization. For management access WebHMI also enabled. Base Oil and Additives are taken from different tanks which have Level Switches to protect from dry running and overfill. Tank Farm is controlled from a Field Controller Panel via HSE (High Speed Ethernet). There are 7 (seven) Kettles for blending operations. These would have necessary heaters and temperature transmitters to monitor the temperature. A blending mechanism driven by suitable motors which are controlled by our offered system. After blending the raw materials until a pre determined time and/or a temperature set point the process will be stopped and the product will be transferred tot holding tanks. Controller Panel engineering and assembly. Cables: Supply and installation of System / power cables. Installation of panels and fittings as required. Field cables interconnection: Supply and installation of junction boxes. Installed base with mass flow meters with present plant facilities. Confidence level at customer end through the technical support provided by DESCON. 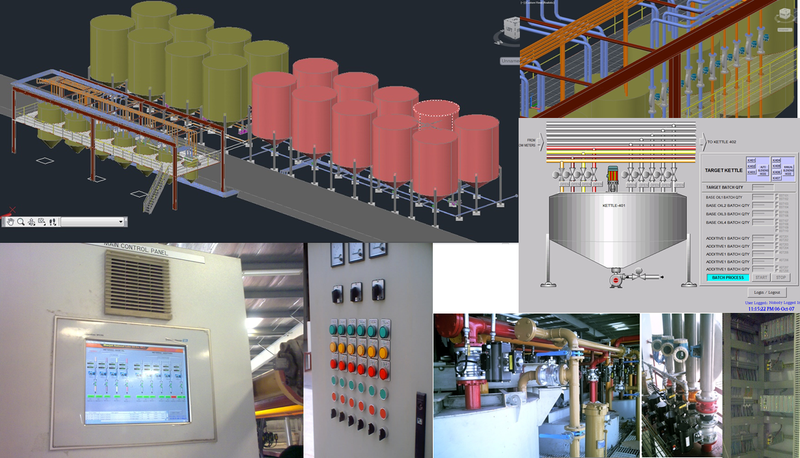 Complete Project Involvement from conceptual design to implementation of Lube Oil Blending Plant – Piping and Instrumentation. Project Execution Team having high caliber and dedication to the organization.